Pulse peanuts in food processor until they are chopped, but before they become peanut butter. Place chopped peanuts on the bottom of a pie plate. Remove bananas from freezer and place in food processor. Blend until smooth, adding in a splash of almond milk if necessary. You may need to stop and scrape the sides occasionally. This process usually takes me 3-5 minutes. 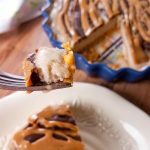 Once your bananas are the right texture, spread them over the peanut layer of your pie plate. Place pie in freezer. Melt coconut oil in the microwave or over low heat. Remove from heat and whisk in cocoa powder and maple syrup until smooth. If you see lumps, keep whisking or heat slightly. Remove pie from freezer and, using a fork, drizzle chocolate over pie in alternating directions. Melt peanut butter in the microwave for about a minute or until thin. Again, drizzle over pie. Place pie back in the freezer for at least an hour. You want it to be very firm when cutting it.